Like any mining junior, the first step for Planetary Resources is resource evaluation. The first step will be launching low-Earth orbiting satellites, Arkyd-100 Series, that will scan for likely targets. Planetary Resources is borne out of a satellite manufacturer, Arkyd Astronautics. 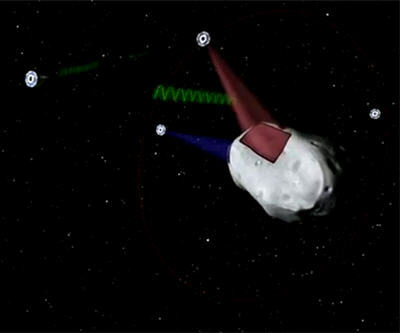 Data will help prioritize near-earth asteroids as targets for the company’s follow-on Arkyd-300 Series swarm expeditions. The company plans to build redundancy into its missions by sending multiple spacecraft on the same mission so if one breaks, the mission can continue. The satellites will also be cheaper. Asteroids, notes the company, are not very far away. "Actually, some near-Earth objects are the most accessible destinations in the Solar System. These are energetically closer to us then even the surface of the Moon and that’s because they have Earth-like orbits and they also have small gravity fields. So, we can reach them with very little propulsion," writes the company. Getting the ore from asteroid to the earth's surface is still a ways off, and the company is leveraging unnamed future technologies. "The microgravity environment presents unique challenges for materials acquisition and processing that require a different way of thinking about the problem. Problems associated material transport and handling must be solved with a new set of tools." The company will be based in Bellevue, Washington. While asteroids are rich in nickel, iron ore and PGM, the company is also keen on finding water. “Water is perhaps the most valuable resource in space. Accessing a water-rich asteroid will greatly enable the large-scale exploration of the solar system. In addition to supporting life, water will also be separated into oxygen and hydrogen for breathable air and rocket propellant,” said Eric Anderson, Co-Founder and Co-Chairman, Planetary Resources, Inc.
Full news release from Planetary Resources is below. Seattle, Wash. – April 24, 2012 — Planetary Resources, Inc. announced today its plan to mine Near-Earth Asteroids (NEAs) for raw materials, ranging from water to precious metals. Through the development of cost-effective exploration technologies, the company is poised to initiate prospecting missions targeting resource-rich asteroids that are easily accessible. A single 500-meter platinum-rich asteroid contains the equivalent of all the Platinum Group Metals mined in history. “Many of the scarce metals and minerals on Earth are in near-infinite quantities in space. As access to these materials increases, not only will the cost of everything from microelectronics to energy storage be reduced, but new applications for these abundant elements will result in important and novel applications,” said Peter H. Diamandis, M.D., Co-Founder and Co-Chairman, Planetary Resources, Inc.
Additionally, water-rich NEAs will serve as “stepping stones” for deep space exploration, providing space-sourced fuel and water to orbiting depots. Accessing water resources in space will revolutionize exploration and make space travel dramatically more economical. “The promise of Planetary Resources is to apply commercial innovation to space exploration. They are developing cost-effective, production-line spacecraft that will visit near-Earth asteroids in rapid succession, increasing our scientific knowledge of these bodies and enabling the economic development of the resources they contain,” said Tom Jones, Ph.D., veteran NASA astronaut, planetary scientist and Planetary Resources, Inc. advisor. Founded in 2009 by Eric Anderson and Peter H. Diamandis, M.D., Planetary Resources, Inc. is establishing a new paradigm for resource utilization that will bring the solar system within humanity’s economic sphere of influence by enabling low-cost robotic exploration and eventual commercial development of asteroids. For more information, please visit www.PlanetaryResources.com.